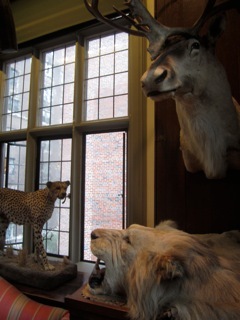 I recently went to an exhibit at the Explorers Club on East 70th Street. I have to admit, the premise was of only mild interest to me. 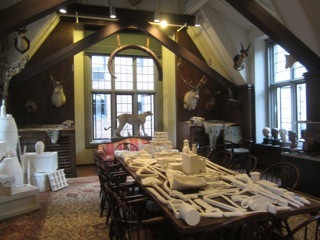 Named “Phantoms of the Clark Expedition”, it featured the work of a contemporary artist, Mark Dion, who recreated utilitarian objects that would have been used on an expedition to China funded by Robert Sterling Clark 100 years ago. What interested me more was that the exhibit was a small part of a larger program currently at the Sterling and Francine Clark Institute in Williamstown, Massachusetts. Growing up in The Central Leatherstocking region, the Clark family’s imprint was everywhere. Heirs to the Singer Sewing Machine fortune, they were responsible for the columned, Neo-Georgian stone buildings that housed the Fenimore Art Museum, the village library, and hospital in Cooperstown. Their family mansions, the elegant buildings on their model farms, an actual deer park on the edge of town, and kingfisher tower (a folly resembling a Rhine castle built on the edge of Otsego Lake) lent a unique feel to that corner of upstate New York and fueled the imagine of a young boy who felt he should have rightfully been born on some ancient estate in England. I knew from an early age (courtesy of my grandmother) tales of a family schism, which led Sterling to decamp for Williamstown, where he built a home for his extensive art collection far away from his brothers and their families. The very fact that this exhibition was being shown in the former townhouse of his estranged brother, would have propelled me to go, even if it hadn’t been a free opportunity to get a glimpse inside of New York’s fabled clubhouses. 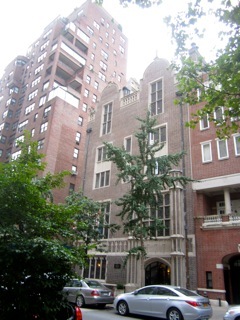 The Explorers club occupies the jacobean style townhouse built for Stephen Clark in the 1920's. 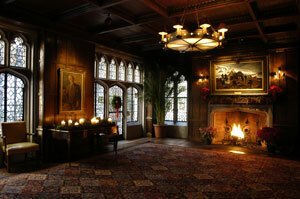 I do not find the exterior particularly elegant, but it certainly commands a presence. 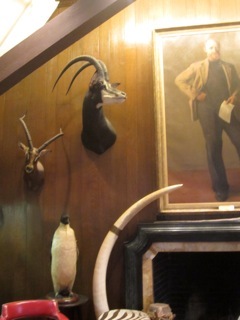 Entering the vestibule, I was greeted by a young docent, who accompanied me up to the mansion's former gallery on one of the upper floors of the mansion. 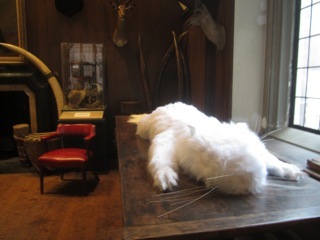 I was equally fascinated by the room, the abundant taxidermy and the exhibit itself - the objects were all rendered in white, and started one thinking of the enormous amount of preparation, provisions and supplies needed for these early scientific expeditions. 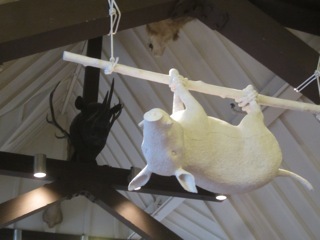 In addition to the recreation of mundane items such as boots, ropes, and a cookfire, A trussed pig and a replica of a snowsquirrel, eight times its actual size, added levity and a touch of the surreal to the exhibit Not only did the exhibit make me want to learn more about the artist, who, it turns out, creates very intrguing work, it also started me thinking about these elaborate expeditions, underwritten by private patrons in the name of science and discovery. I was very lucky in that the young woman who accompanied me up to the exhibit offered to show me around the public areas of club. She knew the fascinating stories behind almost every object, painting and portrai on display. I endeavored to learn more about the club and the characters in its history. Another highlight for me was to see the former library of the mansion. 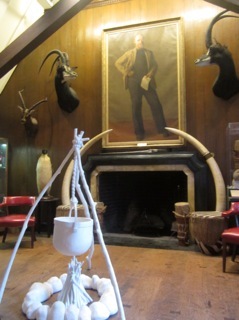 In this room, over the fireplace where an oil painting of an arctic expedition is now displayed, once hung one of the centerpieces of Stephen Clark's art collection, George Seurat's "Side Show" Being reminded of the Clark family's patronage of the arts and sciences, allowed to wander through a well-preserved mansion now housing a private club, whose own history (and present) was equally as fascinating, made it an afternoon well remembered.